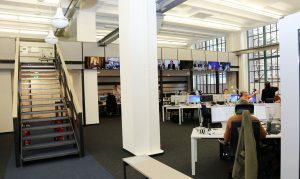 Qvest Media is developing and implementing a new media production system for Germany-based Deutsche Welle. Qvest Media is designing the production workflow based on a scalable and modular cloud-native architecture and infrastructure. The broadcaster’s new technology strategy is using the collaborative use of aggregated and produced content for efficient multi-platform distribution. ‘Online first’ marks a change in strategy at Deutsche Welle and the broadcaster is planning to align its multi-lingual, international portfolio of programmes and news more closely with online and in particular social media channels in future. The project to set up a cross-site production infrastructure is being carried out by the Qvest Media team in close cooperation with the broadcaster’s dedicated project team over the next two years using agile methods. Following the initial product implementation, the system and the workflows will be expanded via multiple incremental sprints together with the broadcaster’s specialists and editors. The core of the powerful solution comprises of Sony’s Media Backbone Hive production system, the Qvest.Cloud Ultimate multicloud management platform and the workflow orchestrator Mayam Tasks. Each week, content from Deutsche Welle reaches more than 100 million people across all continents.